Leptospirosis - it’s a mouthful of a word, but what is it? 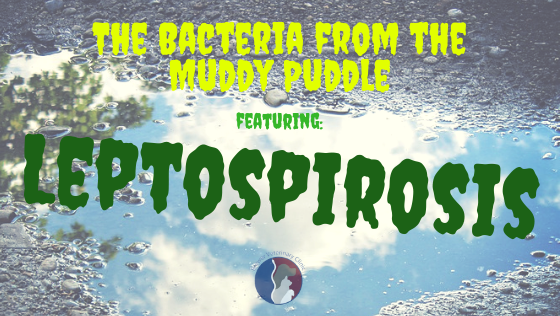 Simply put, leptospirosis (or lepto for short) is a disease caused by the Leptospira bacteria. Like the rabies virus, lepto is zoonotic, which means that animals and humans can both get lepto. It is spread through urine and other bodily fluids (except saliva) from animals who are carries for the bacteria, and those carriers may or may not be actively showing symptoms of lepto. These animals are common in every area of Maine, which makes the threat of leptospirosis not just deep in the woods, but in our own backyards too. Horses, pigs, and cattle can also be potential carriers of leptospirosis. How Can My Dog Get Leptospirosis? The bacteria is spread when it comes in contact with the mucous membranes of another animal. So, for example, if your dog wades through a puddle that another animal has urinated in and drinks from that puddle, there is risk of transmission. Or even more disturbing, a raccoon carrying lepto urinates on the grass in your backyard in the middle of the night. That morning, your dog sniffs the area that they urinated in. The mucous membranes on your dog’s nose have now come in contact with the bacteria left behind by the raccoon’s urine. Lepto, if gone untreated, can also cause liver or kidney failure. Success of treatment depends on how soon it is caught. The best, most effective way to protect your dog from leptospirosis is to have them vaccinated against it. 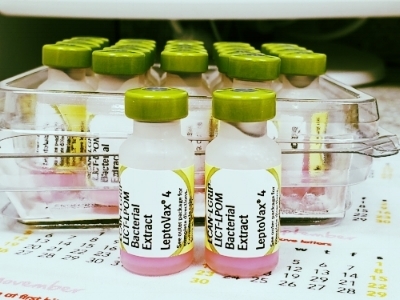 Here at BVC, the leptospirosis vaccine can be offered by itself, or in a combination vaccine with the Lyme vaccine. The lepto vaccine is a 2 part vaccine series that needs to be updated annually after the first series is complete. While no vaccine offers a 100% guarantee, it can greatly diminish your dog’s chances of getting leptospirosis or make the symptoms not quite as severe. The only other way to protect your dog would be to make sure they don’t drink from stagnant water, or avoiding nature walks through the woods. The risk of exposure to leptospirosis increases during rainy periods, so take extra care during the rainy seasons in Maine. As of this summer, there has been several dogs who tested positive for leptospirosis in the greater Bangor area. Since leptospirosis is a disease that humans can get from their dogs, we strongly recommend having your dog vaccinated against it. If you would like to update the lepto vaccine with your dog, or curious to know if they’re current on their vaccine, give us a call at (207)989-6531 and we’d be happy to check it for you!